OBJECTIVE: To compare the incidence of postoperative anastomotic leak following laparoscopic (LP) versus open (OS) lower anterior resection. METHODS: A retrospective review of cases were performed between September of 2000 and June of 2007. A total of 33 cases of LP and 31 cases of OS lower anterior resection were performed by the same surgeon. None of the patients were diverted regardless of whether the patient received preoperative or postoperative chemotherapy chemoradiation therapy when applicable. RESULTS: Anastomosis was formed at a mean distance of 5.5 cm (1.5-8.5 cm) from the dentate line in group LP and 4.5 cm (1.5-7.5 cm) in group OS. The mean number of lymph nodes retrieved in group LP specimens was 16.2 (13-27) and in group OS 19.2 (16-41). 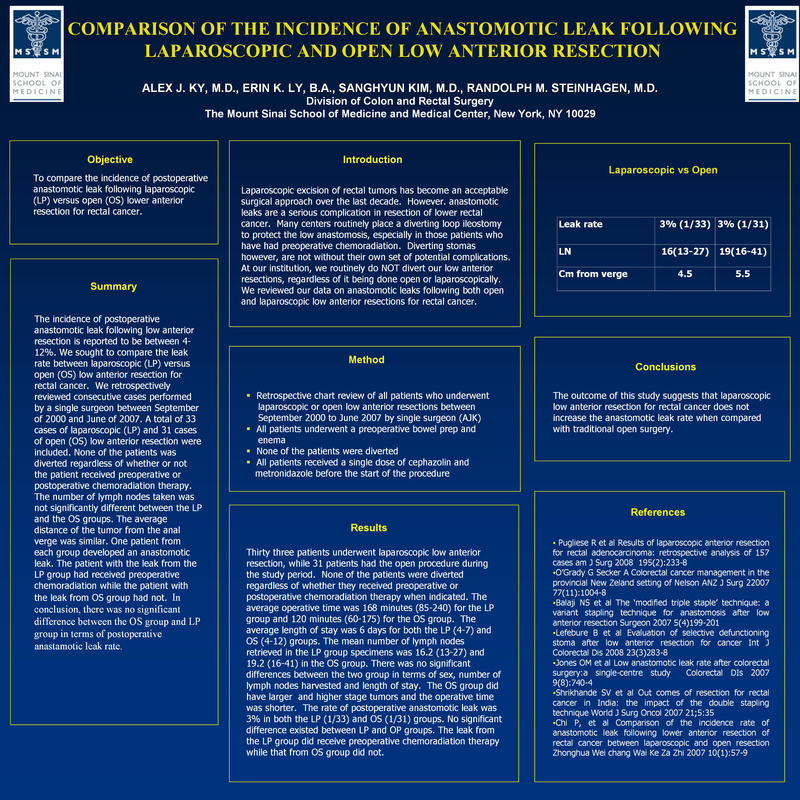 In LP group, the incidence rates of the postoperative anastomotic leak was 3% (1/33) and 3% (1/31) for OS. No significant difference existed between LP and OP groups. The leak from the LP group did receive preoperative chemoradiation therapy while that from OS group did not. CONCLUSION: Laparoscopic low anterior resection of rectal cancer is safe and does not increase the incidence rate of anastomotic leak compared to traditional open surgery.